Top marks for 10 cars in Euro NCAP test | What Car? 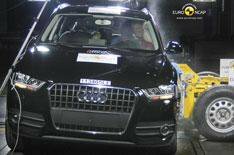 Euro NCAP has released its latest crash test results, with all cars it tested getting its top five-star rating. The Ford Ranger received special praise because its the first pick-up to achieve a five-star Euro NCAP rating. Below are the individual scores that made up each car's rating.